Agilent Technologies have announced a nonlinear modelling technique for components such as amplifiers and transistors that are used in wireless and aerospace defence industries. The X-parameters can be generated either from simulation with the Advanced Design System (ADS) EDA software or from Agilent Technologies’ test and measurement instruments, for faster communications product development. The X-parameters can accurately measure, display and simulate the full amplitude and phase information of each spectral component in non-linear designs. The X-parameters are an accurate non-linear behavioural model that fully characterises and describes the non-linear behaviour of the devices. The X-parameters capture non-linear behaviour with the same ease and accuracy as measuring or simulating linear S-parameters. Agilent Technologies new patent-pending X-parameter technology allows designers to capture the non-linear behaviour of active components such as amplifiers and transistors and save them in transportable RF intellectual property for use in RF system or circuit designs in ADS. 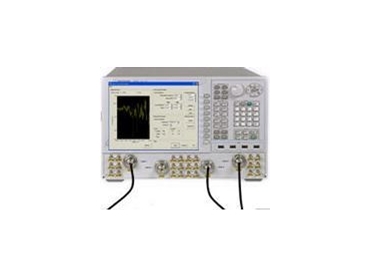 According to Agilent Technologies, generation of a nonlinear X-parameter model from an off-the-shelf amplifier can be done quickly by measuring it with Agilent Technologies Non-Linear Vector Network Analyser (NVNA), and users can start doing non-linear designs with it in ADS immediately. Advanced design system enables X-parameter nonlinear model generation from simulation, allowing design houses to create nonlinear X-parameter models of their RFIC and MMIC, power amplifier modules (PAMs), front-end modules (FEMs) and multiport devices, for example, mixers. This allows RF and microwave system designers to fully characterise systems early in the design cycle and before the hardware is fabricated. X-parameter models protect the intellectual property from which they are generated while retaining the full non-linear characteristics to share with circuit and system design partners. This technology saves time and speeds products to market all along the design chain. According to Agilent Technologies, system integrators can quickly simulate X-parameter RF modules and provide fast feedback to component suppliers before hardware is committed. This resulted in potential design-house savings, reduced IC foundry turns and development costs, along with savings in development cycle time. Early beta customers representing key IC design houses and handset manufacturers are also embracing X-parameters. The X-parameters provide a compact language with which to communicate and simulate non-linear characteristics accurately with full IP protection. Users can also generate X-parameter models with load pull characteristics for accuracy over a range of terminating impedances, from ADS simulation or from measurement on an Agilent NVNA using the load-pull system from Maury Microwave. With load-pull X-parameter models, designers can accurately simulate and optimise critical transceiver and power amplifier specifications such as cascaded output power, power added efficiency, error vector magnitude and adjacent channel power ratio, eliminating prototype iterations with off-the-shelf components.